Light is from heaven, shining down on the man on the left. 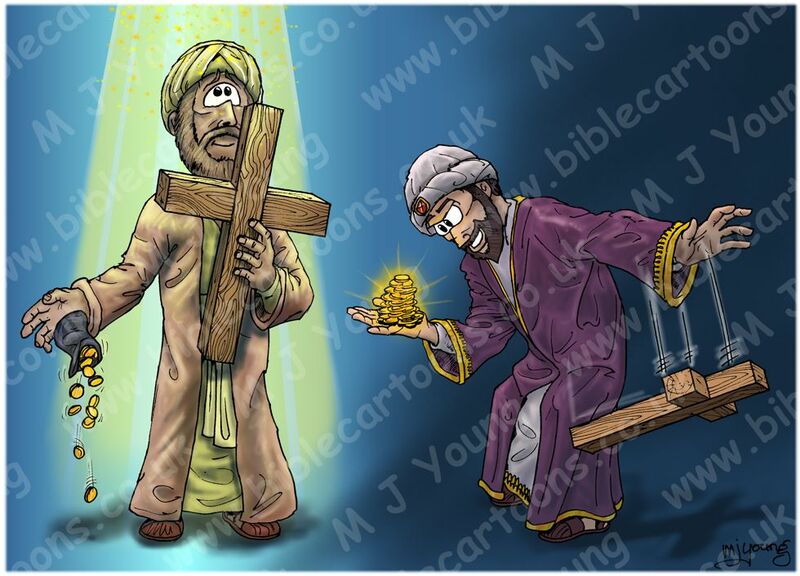 Two un-named men, one holding the cross (who’s master is Jesus) & one holding money. This cartoon is one of many, which together will illustrate the complete “Sermon on the Mount. 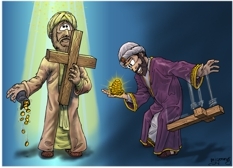 I decided to have the man who accepts the mastery of Jesus holding a wooden cross to his chest. Notice also that a bag of money is slipping out of his hand, showing that money is NOT his master! He is bathed in the light of heaven, complete with little golden stars! The man on the right (in contrast) is gradually being overcome with dark shadows. He is gleefully holding gold coins in his hand & has a covetous expression on his face. Indeed, I have made his face reflect the gold he desires. But the darkness is closing in around him. He doesn’t realise that the money he craves is actually his master.